Facebook HD video Uploads: The leading Social media website in this world at present is Facebook. There is a technical team is working to enhance the features of Facebook on security and others. Recently, the Facebook updated one of the major parts for the Android. Now, the Android users can upload the Videos in HD resolution. After the gap between the iOS update. Finally, the company launched this setting for the Android users. People can spot this update under the app settings menu in the latest version of Facebook. Users can identify this update next to the option of Upload photos in HD. Most of the Facebook users have already identified this update about a week. Also, it is available for all the Android users now. Not only with the Facebook, but most of the lead companies have also recommended the iOS as first. As like that, the brand and blue social media introduced the HD video uploads after the gap of 2 years between iOS. People can also upload the 4K videos now with the help of Android. Also, the Android users can expect the next major update as soon. The company is testing the with a small batch of users, including floating video windows. It allows the users to watch the video while using other apps. YouTube like the offline video option by enabling downloading option. Also, users can select the quality of the video which already provided in the YouTube. 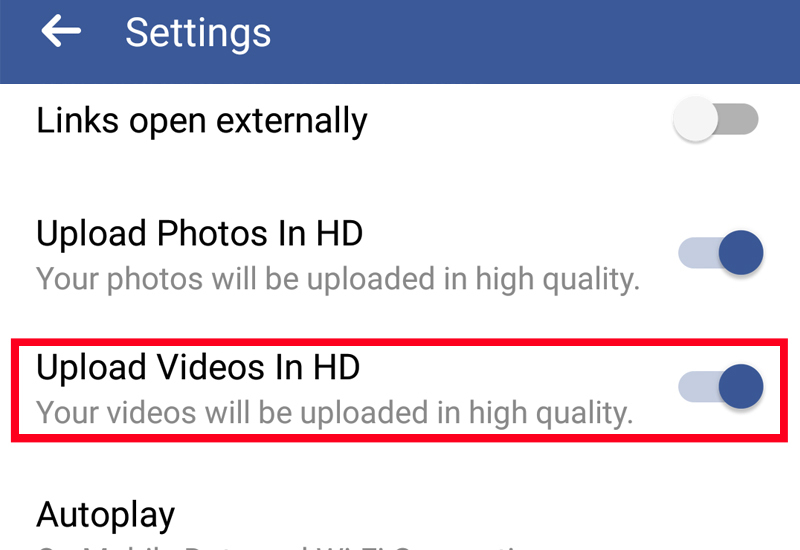 Share your thoughts in the comment box about this new update of Facebook and upcoming features in the category of Videos.